SAN JUAN, Puerto Rico (AP)—Robert Traylor, the former NBA and University of Michigan big man nicknamed “Tractor” because of his hulking frame, has died. He was 34. 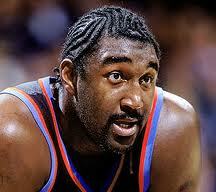 Described as a “gentle giant” with a generous smile, Traylor played seven years in the NBA. He is perhaps most remembered, however, for his career at Michigan, where he was a standout for three seasons but became embroiled in a major scandal involving a booster. Police in San Juan said Traylor was found dead Wednesday on the bedroom floor of his oceanfront apartment. Police and Traylor’s team, the Bayamon Cowboys, said he had been missing for a few days and apparently died from a heart attack. Perez told The Associated Press that Traylor had been talking by phone to his wife in Chicago when the connection was suddenly cut off. She called team officials Wednesday and they checked on him, Perez said. The 6-foot-8, 300-pound Traylor was injured and had not been playing, the team said. Traylor was drafted by the Dallas Mavericks with the sixth pick in 1998, but they traded his rights to Milwaukee in a major deal that sent Dirk Nowitzki(notes) to Dallas. Traylor played for the Bucks in the first two seasons of an NBA career that included stops in Cleveland, Charlotte and New Orleans.